Wooden chicken coops are the most common kind, although these structures can be made from almost any type of materials. Take the Eglu, for example. Instead of wood, it's made from plastic. * It is fairly inexpensive. If you are good at salvaging and recycling, it may even be free. * It is easy to repair. Broken or split boards can easily be replaced - all you really need is your hammer and nails. * It is durable. It can withstand bad weather conditions and will last for many years. The downside to wooden chicken coops is that they are the perfect home for rodents and red mites. 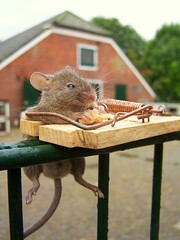 Mice and rats like to take up residency under low lying chicken houses. It's easy for them to gnaw through wooden floors, and once inside, they will feast on spilled chicken feed and even eggs. Keep a lookout for signs that these unwelcome critters have arrived. When they do, eradicate them as soon as possible by using poisons and setting traps. Red mites love to hide in the dark corners of wooden chicken coops. At night, they come out and feed on the birds as they sleep on their roosts. Red mites can cause significant irritation, and may even cause your chickens to pluck out their own feathers. To combat red mites, first use a pressure washer to clean the interior of your chicken coop, then disinfect with a poultry safe product. Despite these problems, wooden chicken coops are one of the best ways you can house your birds. Just keep your eyes open for problems, and take care of them as soon as you notice them.